If you read my previous post you might have picked up on a pattern that i love beauty products. This is absolutely true, i have masses (although not as much of the YouTuber’s i follow) of make-up and skin care. 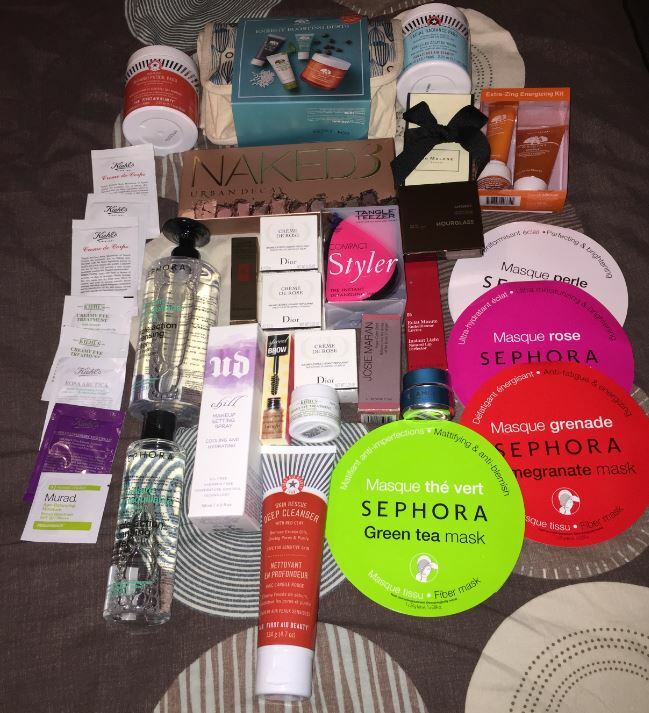 I love trying out new products and even more i love it when i find a product i love and that works – these are the times i end up bulk buying! For a change me and my husband went away for New Year (never done it before) and the chosen destination was New York. This excited me so much as i love the shop Sephora and i knew my husband would be patient enough to allow multiple, lengthy visits during the 5 days we were there. I think i did pretty well in only going in twice but still managed to spend most of my spending money. I stocked up on a couple of products i love, one of which is discontinued in the UK (Dior – what were you thinking, Creme de Rose is an amazing lip balm!) plus i had a whole list (yes i made and printed a list so i wouldn’t forget what i wanted) of products i was keen to try and couldn’t justify buying out of normal monthly wages. I feel the best option is to just post a picture of my ‘haul’! It might not look a massive amount to some but to me this was a lot. What this doesn’t include is the numerous bottles of fragrance i bought from Victoria’s Secret. I love the fragrance Love Spell that they do so bought 6 x 30ml bottles of perfume and 6 x 250ml bottles of the body mist. I know you can buy this in the UK now but it is so much cheaper in the US so it made total sense to buy there. Now i’d love to be able to tell you how awesome all of these products are but unfortunately for the past couple of weeks the dermatitis on my eyelids has flared so i’m having to be really careful what i use. I could almost cry about the fact I’ve only been able to use my Naked 3 palette once! However i will say that the Tangle Teaser is awful. I have long, thick wavy hair and this just doesn’t cut the mustard. It’s not too bad on wet hair but useless otherwise.